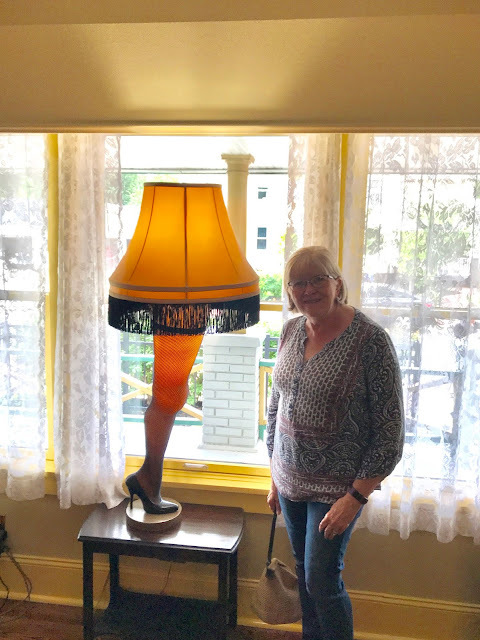 No trip to Cleveland would be complete without a trip to the original A Christmas Story House, right??. Well maybe the Rock And Roll Hall Of Fame is a bit more important but more on that later. The restored house from the movie now allows you to stay overnight in a room upstairs. We were there on a weekday and the place was quite busy. The fans of this b movie never cease to amaze me. Of course I HAD to tell the tour guide I played Jean in the musical version! During the tour I was asked by a man to photograph him while he climbed under the kitchen sink where Randy hid from his father. Truth! From the car used in the movie, (FUDGE but I didn't say fudge) to the notepad used for C+ and PS You'll shoot your eye out...were all there. Fun Fact....they just bought the "Bumpus" house next door and are converting it into a bed and breakfast! The Olds that had the infamous flat! Fuuuuuuuuuddddgggeeeee! You'll Shoot Your Eye Out!! Along with the usual gift shop there is a museum with props from the movie included Randy's snowsuit and toys from Higbees window. While you are at it you can catch a live glimpse of the house at any time...Wow?